For 15 years in a row the Fanfara Tirana music band remains among the only high quality music products Albania exports. 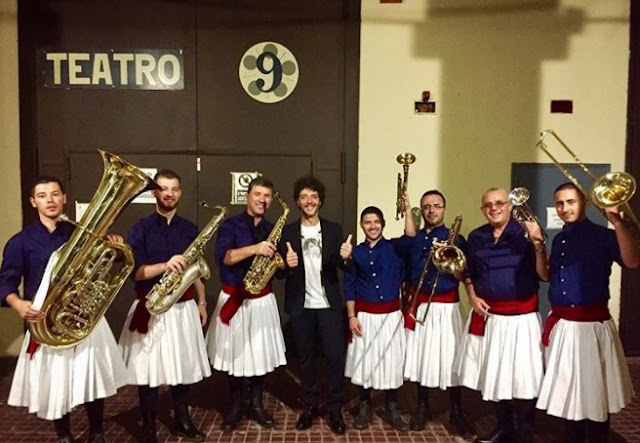 Yesterday evening, after the performance of May 1, 2016 along with the Italian cantautor Max Gazzè when donated to the public of Rome the Albanian white fez, Fanfara Tirana again appeared as guest on the most important show of the Italian state television, RaiUno. "One, Two, Three ... Fiorella," is a spectacular two-Saturday show (September 16 and 23) that opens the Winter season in Rai's most important channel under the guidance of one of the Italian icons as Fiorella Mannoia. Fanfara Tirana's boys revealed their white traditional kilt and accompanied Fiorella and Max in their live performance. The first time in Rai's story where an Albanian band performs live. The 2018 for Fanfara Tirana will be full of surprises. Two new albums of which the second volume of Kabatronics with the English Transglobal Underground and the collaboration with the Albanian genius of music, composer, pianist and guitarist Robert Bisha. Meanwhile, you can watch them live in Warsaw on September 28 in Cross Culture Festival, or at Budapest in Ritmo Festival on October 8 and in Kaba 2.0 Festiv.al in Korça that will be announced soon.